Has your computer come to a crawl because you have dozens of tabs open? Obviously, closing them would fix the problem. But you want to…no, you need to keep them open. You’ll use them soon and you don’t want to loose them. You have two options. You could save it in Pocket . 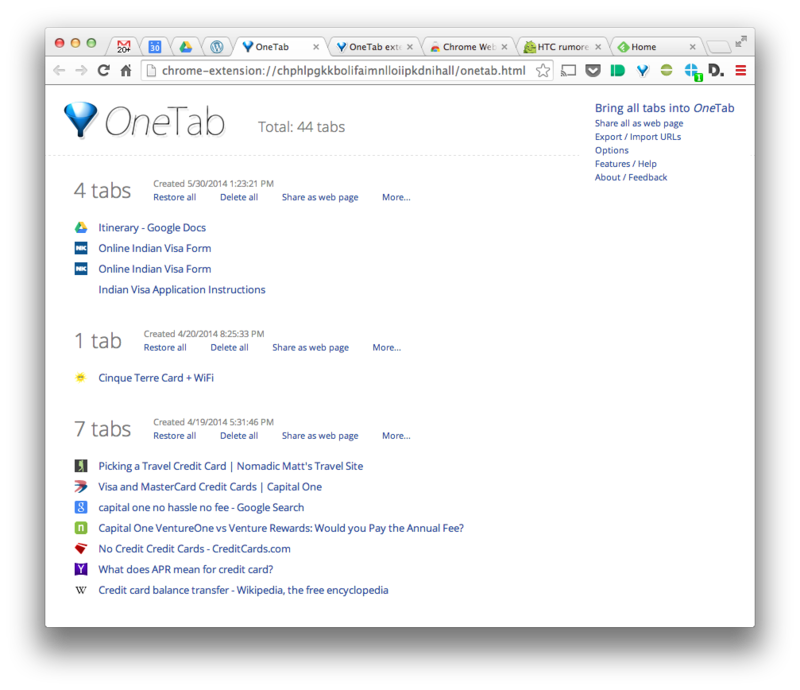 Or, if you use the Google Chrome browser, you could use the OneTab extension. OneTab closes all the open tabs in a single window and saves them as a list of hyperlinks. Simple as that. Opening a new window and clicking the extension will open your saved lists of hyperlinks. Any tabs that you’ve pinned will not be closed by OneTab. This extension is great for saving pages you’ve opened while researching something that you want to come back to later. Sure, it’s not full featured like Pocket since you can’t view your pages on your other devices. However, that’s kind of the beauty of it; it has one single function. The major benefit of OneTab over Pocket and Instapaper is its ability to restore multiple tabs at once. While the read-it-later services do save webpages, each are saved individually, making them not ideal for saving a grouping of related websites to open later. A word of advice, remember to open a new window before you go about opening OneTab to restore your saved pages, since the service automatically saves and closes unpinned tabs. If you have Chrome and your computer slows down occasionally due to copious amounts of tabs being open, do your self a favor and download OneTab in the Chrome Web Store.